It's been a rocky ride for the Federal Reserve this year. Many a time, a rate hike was on, then off, then on again, then way off again. We'll know more soon -- the Fed kicked off its two-day meeting on Tuesday and will end it with a press conference on Wednesday. But the back and forth this year isn't appreciated on Wall Street. Right now the odds of a rate hike on Wednesday are 2%. "It looks like June is off the table...the Fed is in a wait and see mode," says Anthony Bedikian, head of global markets at Citizens Bank. Here's how the Fed got to this point from just six months ago, and where it's headed. In December, Fed officials raise rates for the first time in nearly a decade and signaled that they would raise rates four times in 2016. It was a landmark moment for the U.S. economy and signaled its recovery from the recession. A forecast for four rate hikes indicated that the Fed would likely raise rates in March, June, September and December -- the meetings that have press conferences. Global markets plummet amid fears about China's economy and currency and falling oil prices. A major disparity happens between the Fed's expectations and Wall Street's projections. Early in January, the Fed's Vice Chair Stanley Fischer maintains that four rate hikes in 2016 are possible. But Wall Street expects only two. Then Fed officials turned around and significantly changed their forecast of rate hikes for this year to two, down from four. By this point Wall Street was one step ahead -- dialing down its forecast to zero rate hikes for the year. In the same meeting, the Fed also lowered its expectations for economic growth. Yellen raises a yellow flag on "global risks" that could hurt the economy. Despite lowering its forecast, some regional Fed presidents, such as St. Louis Fed President James Bullard, suggest there's a chance of an April rate hike. Some economic data has improved and investors' expectations rise for an April increase. In a speech in New York, Yellen quashes such talk and says the Fed must proceed "cautiously" after noting concerns about the global economy, low inflation and some gaps in the job market, such as part-time workers. Yellen's speech wipes out any chance of an April rate hike and lowers expectations for future increases. In May, a slew of economic data -- from housing to motor vehicles sales to modest wage growth -- improve. 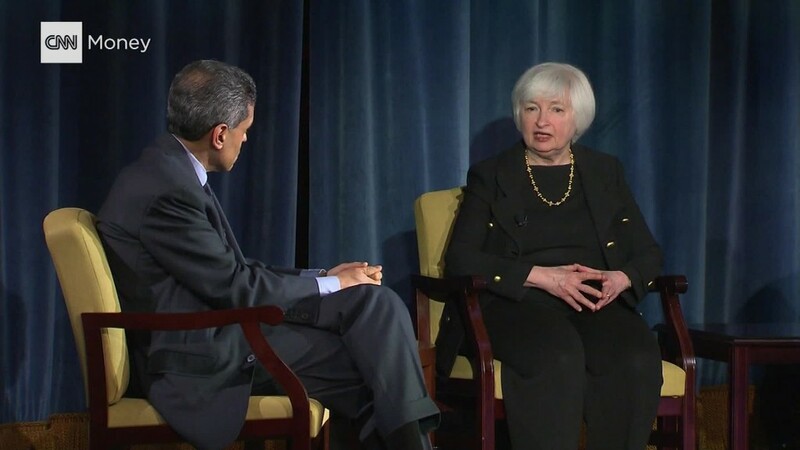 Fed officials go back on the speaking circuit and say that a June rate hike is very much on the table. Some criticize Wall Street for having such low expectations. Investors raise June rate hike odds up to about 36% after being in the single digits. Even Yellen, speaking at Harvard, suggests the Fed will probably raise rates in the "coming months" which many assume means June or July. On June 3, the U.S. jobs report for May was released, and it was ugly. The economy only added 38,000 jobs -- the smallest increase since 2010 -- many Americans stopped looking for work, and the number of people with part-time jobs increased. Yellen changes her language in a speech on June 6 and seemingly backs down from hopes for rate hike soon. Will we get even one rate hike this year? Wall Street only thinks there will be one this year, according to data collected by CME Group. On Wednesday, Fed officials will release a new forecast that will shed more light on their plans for the rest of the year. But don't frame the forecast on your fridge. It might all change in a week. Again.